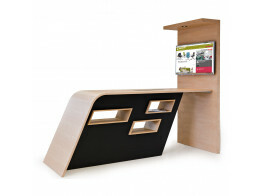 Apres Furniture supplies the latest office AV media units on the market today. Innovative office media units with built-in AV allow you to hold small informal meetings with colleagues whenever you like: it's all set up and ready for you to use! With integrated USB, VGA, data connections, and more, you can hold presentations in small groups with integrated solutions from Apres. Connect tablets, laptops and compatible smartphones for shared working. Fully integrated and installed visual display units such as high resolution HD monitors and televisions offer a high definition representation of your work, website and media content. Office AV media units offer a modern office a focal point for co-working. Any contemporary smartworking environment will have internet connectivity. Why not share this easily in one place with an office av media unit? Use one as part of a working breakfast, discuss your goals and sales targets over a coffee, whilst everyone engages around technology in one place. 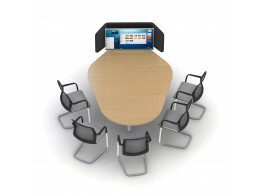 Connected meeting points offer collaborative working; moving away from isolated desks into one space, whilst remaining in touch. Finding the right office media unit for you couldn't be easier. We can work with you to customise an office av meeting point to fit into your open plan office. Please give us a call to discuss your requirements. We'll help get you connected. Cwtch Workbay Sofa is an acoustic high back workstation with fixed table for private meetings. Silent Wall is a flexible modular screen system that divides office space and optimises acoustics. 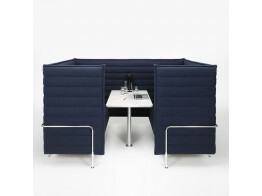 Entente High Back Sofa is the perfect place to enhance collaborative work in the office. Wing High Table is a informal meeting point solution with AV capabilities ideal for agile working. Portal Mobile AV Screen is a plug and play presentation solution for flexible environments. Away Media Meeting Units provide informal meeting areas with fully connected AV, 'click share' and VDU. 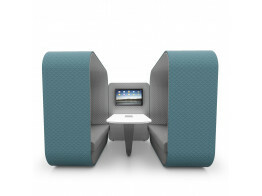 Cocoon Workbay Sofa with built in AV and an integrated table for interactive and private meetings.